I thought I would start off my very first blog post by telling you all about my recent trip to Paris! 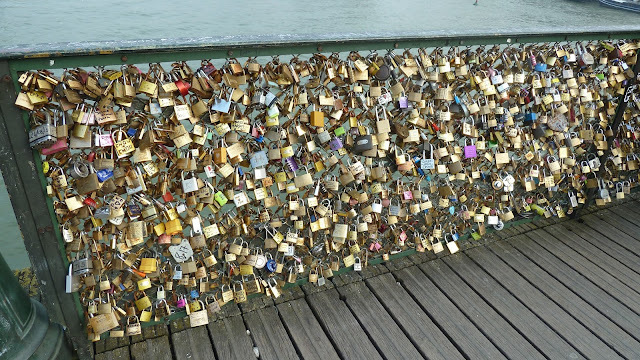 I saw so many amazing things but one memory that really sticks out was the Padlock bridge. Have you heard of it?! I didn’t have a clue what is was or what it signified but I did a little research and it turns out it’s called the Lovers Bridge and is very famous in Paris. Love-struck sweethearts attach padlocks to the bridge inscribed with their names and dates as a sign of their eternal love and toss the key’s over the edge into the river Seine. On inspection of the padlocks it became clear they were romantic gestures, Paris being the city of love and all that, and I just found it so cute and inspiring. A must see if you’re in Paris on a romantic break with your loved one. What made it even better was an actual newlywed couple having their wedding photographs taken on the bridge whilst I was there, attaching their padlock and throwing away the key over the side. I managed to snap a few pictures to show you! Whoever said romance was dead?